This Big RG Kit includes our 160 watt 4- channel NCA 40.4 amplifier with NEW mounting plate, a pair of 5x7" front speakers with adapters and new grills. A pair of our 117.2-AA rear speakers 100% plug-and-play wire harness. 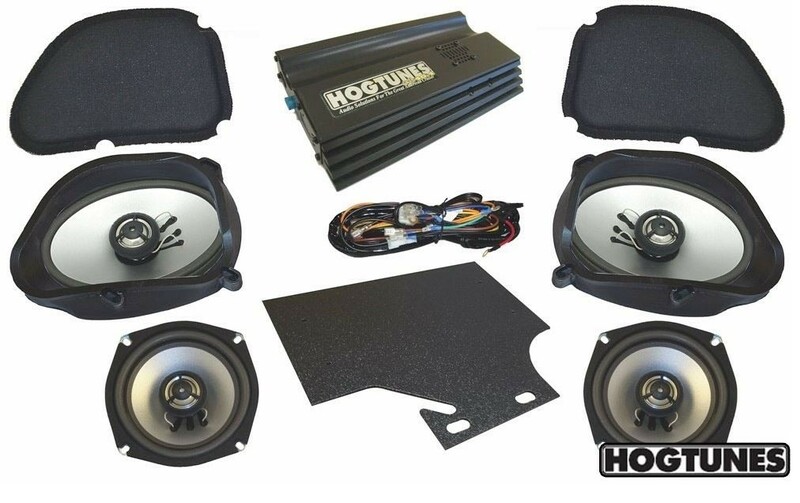 Fits 11 FLTRU and 98-11 FLTR w/ King Tour Paks and rear speaker boxes installed (part #4405-0229) (except CVO) This Big RG Kit includes our 160 watt 4- channel NCA 40.4 amplifier with NEW mounting plate, a pair of 5x7" front speakers with adapters and new grills. A pair of our 117.2-AA rear speakers 100% plug-and-play wire harness. The NCA 40.4 amplifier mounts inside the fairing and on the brake side of the bike. The rear wire harness has a quick disconnect plug so that if you turn your TourPak® into and de-tatch this harness will make your job so much easier. The Speakers have a special adaptor plate that holds the new sized speakers and also gives you a new speaker grill as well. These 5x7" speakers are 30% larger then the round stock speakers to give far more bass and volume at speed and come complete with our 20 year warranty.